Rockstar have today released a much needed update to Grand Theft Auto III for iOS. Version 1.30 of the game adds features that many players have hoped would be added, myself included. The full change log is as follows. iCloud save game support for seamless progression across all your iOS devices. Various stability and bug fixes. iPhone 5 support and iCloud save games and sync support are an extremely welcome additions which we're sure many players will be happy about. Two other noticeable yet unmentioned fixes include a slightly refreshed app icon, as well as this they have finally fixed the name of the app, which now correctly says "GTA III". Lovely stuff. You can update GTA III right now from the App Store on your devices, or from iTunes. If you don't already own a copy, here's a link to the iTunes store page, it'll currently set you back just $ 4.99 (�2.99 / 3,99 �). Back in July we reported on Grand Theft Auto III coming to the PSN store as a PS2 classic. That release got pushed back due to some licensing issues around certain music in the game, however, the US PlayStation Blog has confirmed today that GTA III will finally be arriving on the US PSN store tomorrow, 25th September, and will set you back .99. Currently there's no word on availability or pricing in other regions; Europe, Asia and elsewhere may also see it tomorrow, or we may have to wait another week or so. Having said that, last week PlayStation Asia had a page up on their site for GTA III which did specify the 25th September release date for that region as well, but the page was later taken offline. The fact this was even published could indicate a worldwide release was planned, or could have simply been some misinformation that was mistakenly put online. As we mentioned before, GTA III is being released as a PS2 classic - a direct, no-frills port of the original PS2 version. Unfortunately this means no remastered HD graphics, and no trophies, but hopefully the lack of such additions won't put you off replaying this amazing game. Some of you may now be wondering if Vice City and San Andreas will also be re-released on the PS3. Back in June, ESRB ratings were spotted for both GTA III and Vice City, but so far only GTA III has been talked about. It's worth pointing out that the 10 year anniversary of Vice City is coming up in just over a month, so it's plausible that Rockstar may re-release the game then to coincide with that. As a sidenote, there's been absolutely no talk of a mobile version of Vice City for iOS and Android coming out for it's 10th anniversary � la GTA III's last year. As for San Andreas on PS3, there's been no talk of that either. Let us know in the comments if you plan on getting this game again, and if you do, get ready for a lot of nostalgia. Back in January we heard that Grand Theft Auto III and Vice City would be coming to the PS3 in the form of PS2 Classics on PSN. And today, the official PlayStation Blogcast has confirmed that GTA III at least will be arriving on the PlayStation Store this Tuesday, 31st July. The game will be released as a "PS2 Classic", which unfortunately means it's simply a direct port of the PS2 version of the game. So sadly there will be no fancy remastered HD graphics or trophies that many of you were hoping for. The game will set you back .99 in the US. No word on availability in other regions yet. We'll update if we find any information on that. UPDATE: Looks like the release won't happen this week. 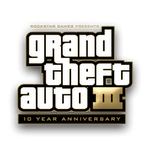 Note: Due to an unforeseen complication, the Grand Theft Auto III PS2 Classic is not publishing with today�s Store post. We will update you when a new release date has been identified. We apologize for the inconvenience. There were some last minute issues with getting clearance for a certain audio track in the game; but the teams at Rockstar are on it to review how to best get this title on PSN. To update your game just head over to the Android Market on the web or on your device where you'll be prompted to download the latest version. Rockstar have stated that an update for the iOS version is currently being worked on, more information will be coming forth on that soon.